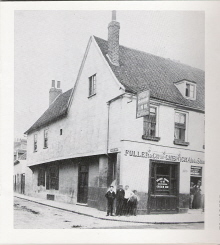 The old Red Lion, 318 Brentford High Street in 1965 was in existence since at least 1669. You can see the car park at Albany Parade behind it. The 'new' Red Lion won the Evening Standard Pub of the Year in 1967 and was know for its live music. 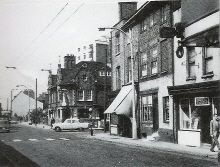 The site was acquired by McDonalds in 1996 and the pub was demolished. Brentford's 50 Pubs - Where are they now? Can You Help Solve A Mystery? If you have any historical images of Brentford to share, please email them to editor@brentfordtw8.com so they can be added to the photo album. Ownership and copyright will be credited where applicable. Many former residents of Brentford returning after some years of absence look with surprise at the latest work of clearance that is proceeding at the junction of what was Drum Lane, now Ealing Road and the High Street. After along period of consideration and negotiation the District Council decided on the widening of the small end of Ealing Road to correspond with similar widenings being carried out at the Ealing section, as it was found that the spot was peculiarly dangerous for traffic especially since the introduction of the ‘bus service. At last the congeries of ancient dwellings on one side of the road have disappeared and the widened road is taking form. The ‘original Red Lion’ at the corner now stands up boldly exposed to public view, and a handsome site for some noble building occupies the opposite side of the road. The old ‘Drum’ has vanished for ever and strangers passing imagine that some sort of Kingsway or Aldwych is being constructed in the old county town. There has been no clearance like this for many years, and the aspect that part of the High Street now gives a sort of picture what other parts might be like if the reforming hand were applied vigorously to some of the many houses that are worn out and, having served their purpose, ought to make way for something more sanitary and up to modern requirements. At present the process hangs fire, as the County Council have put all their money into the new road, but the necessity for rebuilding most of the High Street remains, and possibly when the deities from the County Olympus at Westminster view the new Ealing Road their hearts may be softened to the extent of relaxing the county purse-strings. On of the most interesting features of this work is the fact that the roadway is being made of reinforced concrete. That process is now in course of being carried out, and the curious, in passing, gaze with surprise at rolls of steel netting which form part of the road bed. This method of road-making is quite modern, but it is reported that where tried the results have up to the present been excellent. It is, however to be hoped that the smooth and hard new road surface will not induce motor-drivers to indulge in undue speeds when rushing out of the Great West Road into the town, or take to sprinting along the road when running up to Carville Park. The improvement is unmistakable, and though long in coming, may perhaps be a herald of other and large reconstructive works in Brentford.